Disney has had a huge success on its hands this holiday season with the studio’s latest animated feature, Frozen. It’s a fun film, with as much for adults to enjoy as for children. To me, one of the biggest surprises about the movie was the attention that was paid to costumes, which usually take a bit of a backseat in animation. While the pantheon of Disney princesses has produced some iconic gowns, usually they are relatively one-dimensional, and most characters only have one or two costumes throughout their story. Frozen breaks out of this mold, to great results. I did a little digging about the look of Frozen, and was unable to find specific costume design credits. (If anyone does come across more information, please feel free to leave me a comment.) But I did discover that the animators did extensive clothing and fabric research, even dressing up and venturing out into wintry, snowy conditions to observe how the fabrics would behave. The Hollywood Reporter put together a fun behind-the-scenes piece about the film, in which they talk to co-director Jennifer Lee about the attention to detail that went into creating the looks for each character. Though the film doesn’t appear to have one specific designer, Lee reveals that many of the usual elements of the costume design process (character development, seasonal functionality, etc.) were taken into consideration by the directors and animators. 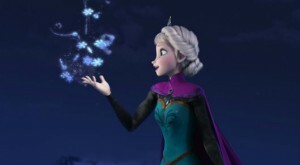 Frozen is a very loose adaptation of Hans Christian Andersen’s The Snow Queen, and centers around two sisters and the struggles that stem from one sister’s ability to create ice and snow with her hands. Elsa, who becomes the Snow Queen, begins her story arc in hiding, trying to conceal and stifle her powers. Her early costumes reflect this – she is almost entirely covered up, with long sleeves, gloves, and a high-necked cloak. I was struck by how beautifully the animators captured the look of black velvet for this ensemble. During the musical number, “Let It Go”, as Elsa’s character sheds her inhibitions and lets loose with her powers, her costume also undergoes a fun transformation. By the end of the number, she is wearing an ice-inspired, shimmering gown. The character artists gave her skirt and cape a fluid quality, and her bodice looks like it is made of icicles. I especially love the glittery snowflake detailing on her cape. 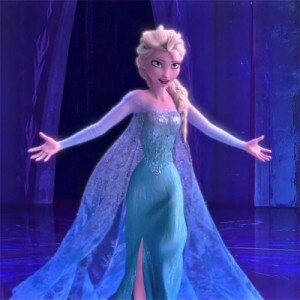 Elsa’s sister, Anna, also wears a series of captivating costumes. Throughout the film she wears a variation on the same bodice, with different colorful skirts and accents. She almost always has floral-inspired detailing on her clothing, part of the animators’ effort to use the beautiful Norwegian painting technique of rosemaling throughout the movie’s production design. Anna’s dress for her sister’s coronation has a pretty, green striped skirt, which starts out soft and flowing, but ends up humorously (and realistically) stiff and crunchy after an encounter with icy water and snow. The winter gear she wears during a large part of the story seems simple on first glance, but really has quite a lot of nuance. Her bright pink cape and blue skirt are cheery and colorful, but animators made sure they also looked functional, and heavy enough to endure the winter conditions. It was an interesting choice, too, to have this outfit reflect Elsa’s pre-transformation costume. 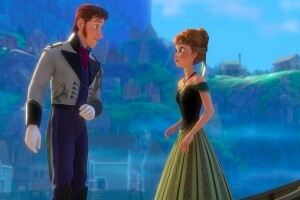 While Elsa’s ensemble is a bit more sophisticated, and the colors were more muted, Anna’s is more fun and youthful. But there is enough similarity between the two, mirroring Anna’s desire to be closer to her sister. An enormous amount of detail went into the costumes in Frozen. Even the primary male characters had a great deal of intricacy in their wardrobes. Prince Hans’ silhouette was streamlined but regal. Kristoff’s clothing was much more utilitarian, but still artful. He wore thick, bulky fabrics to ward off the cold, and illustrators did a beautiful job of making the fur that lines his jacket look realistic. His embroidered red sash gave him a pop of color, and helped create a piece of visual unity between him and Anna. In addition to the leads, there were many peripheral characters and “extras” in both fancy dress and winter woolens. The movie has a huge scope, and a great look. It’s intriguing to see the constant advances in animation technology, especially as they begin to involve the elements of costume design more and more. As animators are able to add more layers, detail, and realism to their art, there are greater opportunities to incorporate clothing into character development, and go further with costumes than ever before. I’m curious to see where it continues to go from here. It should be a fascinating evolution.